Few people in America will argue that walleye is the tastiest of freshwater fish. Northern anglers across the country spend millions of dollars chasing them for the dinner table, and walleye fishing tournaments are gaining steam in popularity. With northern waters now thawing, and Megaware protecting your boat, there is no better time to stuff your freezer with early season walleye. When it comes to fishing, Minnesota and the “Up North” is a unique experience. My travels to countless bait shops across the country has proven that, in nearly all of them, 70% of their tackle is aimed to catch bass. But not Up North. Once, I was told by a Minnesota resident on the shores of famed Leech Lake, “When we finish getting our limit of walleye, we go back out and catch another.” The tackle shops are in reverse order here – 70% of their tackle is for walleye. And catching early season walleye is some serious business. So where better to seek out advice on the tasty fish? Walleye guru Nicole Stone currently resides in North Dakota, but grew up in Minnesota. 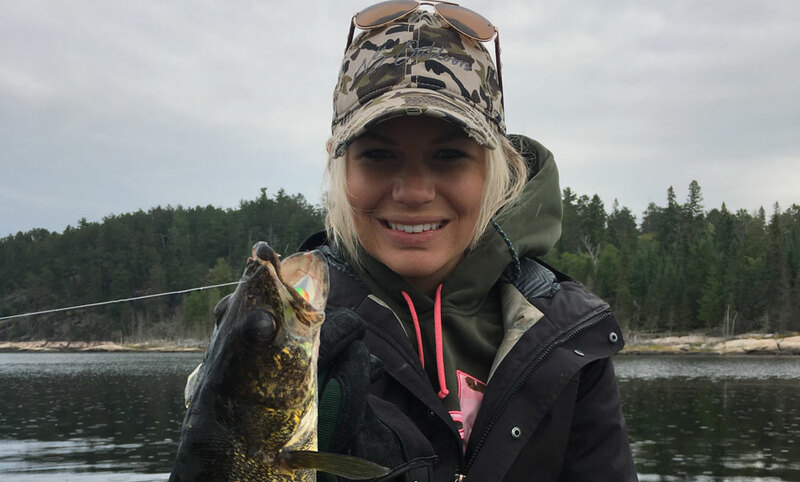 She has been chasing and catching walleye for over two decades, “I started fishing when I was six and walleye fishing shortly thereafter,” she recalls. “I’d go down to the local river and cast jigs and twisty tails off the banks in the evenings.” If filling your freezer with early season walleye, or hanging a trophy on the wall is on your bucket list this year, following her advice throughout the Q & A below will lead to success. What is optimal water temperature for early season walleye? From ice out to the low 40’s F is a great time to target walleye. This is the pre-spawn period where the fish are aggressive, and a great time to catch many of the big fish before they enter the spawning period. Walleye will likely spawn in the upper 40-degree temperature range and then fishing will shut down during the actual spawn and usually the week or so after as they recover from the stress of spawning. Generally, right before the pre-spawn period, or a week or two following, tend to the hottest times to target walleye. That is why people will flock to popular streams (for example Rainy River in Minnesota/Ontario) immediately following ice out. This is one of the best times to catch walleye, and large ones at that. When walleye spawn depends on two factors: length of day and water temperature. Length of day offsets the extremes of temperatures. However, water temperature differences can still mean the difference of fish spawning in early April or early May in this part of the country. Walleye on average spawn when temperatures hover in the mid to upper 40’s. This of course depends on locale. Fishing heats up around these temperatures, but not during the actual spawn. Prespawn is a hot time to fish and usually picks up when temperatures start hovering that 40 degree mark; dies down during, and immediately following the spawn, and picks up again as temperatures rise through the 50’s (on average). The actual spawning period only lasts a few days and as I mentioned, is entirely dependent upon water temperature and time of year. River walleye will spawn before lake walleye, because the water warms faster and ice off is sooner. I would avoid fishing the spawn or the weeks immediately following the spawn. Fish are stressed at this point and unlikely to feed during this period. It is better to wait until a few weeks following, or go before a few weeks before, and targeting pre-spawn areas. Of course, knowing this can be a challenge, which is why it is important to reach out to bait shops, local residents, or resorts in the area who know what pattern the fish are in. Again, this depends greatly on their water body of origin and its conditions: reservoir, lake, or river. However, in perfect conditions walleye can be found spawning in the shallows on rock and gravel. This often means migrating up rivers or streams when applicable, making rivers a hot spot during the pre-spawn period. Males tend to reach these areas first, and stay longer. Older females will have a quick entrance and exit to spawning area, and then usually return to deeper, calmer water. Smaller females will often congregate to easy food sources, often in the shallows looking for perch. Sometimes in the weeks following the spawn, when the temperatures rise into the upper 50s, I will go deep when the other anglers go shallow. Find structure in the 20 to 30 foot range can produce some of the bigger fish. Any hole under a tree or deep bend would be a decent target all season long. However, the best river fishing tended to be in May, depending on the timing of the spawn. Can walleye be caught during the spawn? During the actual spawn is usually one of the most challenging (and worse) times to go walleye fishing. This includes the week immediately following the spawn (when they are recovering). That is not to say anglers have not caught fish during this time, because I know they have. However, during this period these fish care about one thing (reproduction) and food isn’t it at this point. Keep in mind, spawning usually occurs during Minnesota’s closed season, which is in place to protect the big fish. This limits opportunities during this time anyway. However, other states such as North Dakota allow walleye fishing year around. Be sure to check your local regulations if you are new to walleye fishing. Most of the time I have heard of actual spawning walleyes being caught on small streams and small rivers in comparison to bigger bodies of water, but this is not the best time to catch them. Instead target these areas when the water temperatures are cooler to catch them pre-spawn. The bite can also pickup in the weeks after spawn in the some of the more traditional walleye locations as they begin to feed again. “Where” is entirely dependent on the body of water, where they chose to spawn within that water (they tend to go to the same places over and over again for spawning). What are your preferred tactics and baits for early season walleye? I find that it is tough to beat jigs at any time. You can vertical jig in the deeps, you can drift in the shallows. They are highly variable tool that give you the flexibility to target the walleye wherever you can find them. You can “pitch” them, drag them, or let them hang, depending on the walleye’s mood. When I jig, I pick the lightest possible size that will still reach the bottom. Depending on current, this usually means 3/8 or 1/4 oz jigs. Color is guessing game! I try one and if it does not work I try another! My latest obsession are Kalin’s “Google Eye” jigs. They add a “rattling” factor to grab their attention! However, I am also a big fan of crankbaits. The thing with crankbaits is there is only really one method to work. It is more of a reaction bite and allows you to cover significant ground. I’ve heard of angler’s having a lot of success during the pre-spawn period running cranks up and down rivers as walleye start migrating through for the pre-spawn period. However, you do not get the variability that you do when running a traditional jig and minnow. I use shallow cranks almost exclusively. A Rapala Shallow Shad size 5 or 7 work perfectly. You cannot go wrong with anything that represents natural bait – in many lakes that can mean a shiner or perch pattern will work well. The difference between early season and mid-summer is generally the speed. I tend to prefer slower early season and a bit faster mid-summer. Most of the time varying between 2 and 3.5 mph. It also depends on what the fish want that day, and that’s up to you to find out (don’t be afraid to switch up methods). Trolling v. drifting: which is better for catching early season walleye? When determining if trolling or drifting is better, it depends on the wind, river or lake conditions, and if you have found the fish in significant numbers. When you find a large number of them together, it is tough to beat a jig. When the fish are spread out and on the move, trolling with cranks or spinners are a great option! I personally LOVE trolling during twilight or overnight during a full moon on a clear water lake (stained water makes this very difficult) in the summer, when the day bite is tough. We often use shallow crank baits in bright colors, trolling in between 5 and 9 feet. Some of the largest numbers of fish I have caught have been this way. When in doubt, trust your electronics: find the fish FIRST and then go through the presentations until you find one that works. Trust your boat too – protect it with Megaware and then go load the boat with the tasty early season walleye. The number of self proclaimed fishing experts that exist these days is mind numbing. Thanks internet.